Connect with Family and Friends! 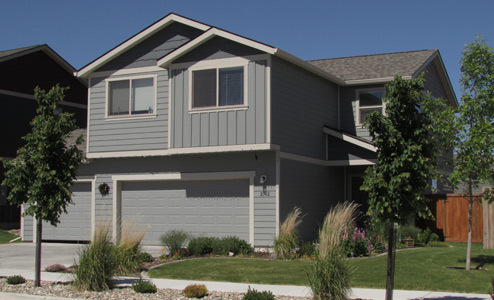 If you love traditional back yards, contemporary floor plans, landscaped boulevards and gorgeous mountain views, then Antelope Trace at Mountain View Meadows is the neighborhood for you! Ample sized city lots and covenants that allow wood privacy fences that meet design standards provide the opportunity to create your own backyard oasis from that rear patio you’ve always wanted to a fun play area for your children, a place for your dog to run, or for that big backyard BBQ for your family and friends. Most homes in Antelope Trace range in size from 1200-2500 Square feet including modestly priced single-story and two-story homes perfect for first-time and move-up homebuyers. Some lots accommodate home plans with a 3-car garage and all lots have set-backs that afford additional parking space in driveways for an extra one or two average-size cars or trucks. With the advantage of on-street parking, your guests should always be able to find a parking space close by—and with city sidewalks on every block, you and your family can safely connect with friends and neighbors, take full advantage of the great recreational amenities at Mountain View Park, and access the 2.5 mile paved Fun & Fitness Trail that runs all the way from Highway 12 to Highway 282. Lots are now available in Phase 3 at Antelope Trace including both level and walk-out lots and several lots for rear-load garages. For lot information, visit the Information and Sales Center at the corner of South Alice and Stacia or call 406.449.0800. Information is also available at the Center regarding move-in ready homes, approved house plans and approved builders. Have your own builder? 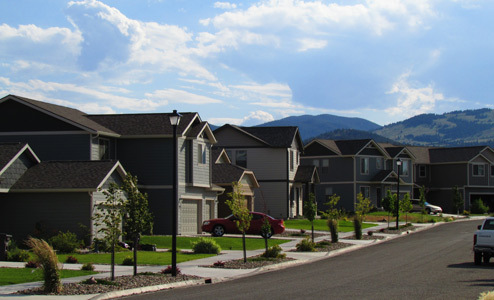 Have a plan that you think fits the neighborhood? Stop by or call to find out how you can start the process for having your builder or design approved. We are here to make it simple for you to find your new home in Antelope Trace at Mountain View Meadows.